March First Friday is March Madness! Want proof that downtown Marion has a happening scene? Join us on the first Friday of every month to experience all the sights, sounds and tastes the downtown has to offer. Take a look – and you will find that place to live, work, shop, and play is here! Let your imagination be your guide and join the Marion Public Library Lego Club. Reserve your plot in one of the Marion Community Gardens. Enjoy the sweet sounds of Heartstrings Ensemble Shane Laubach and pianist Peggy Wright. Learn more about upcoming events from Main Street Marion, Juneteenth, and Links for Health. Shop and support local artisans and merchants. 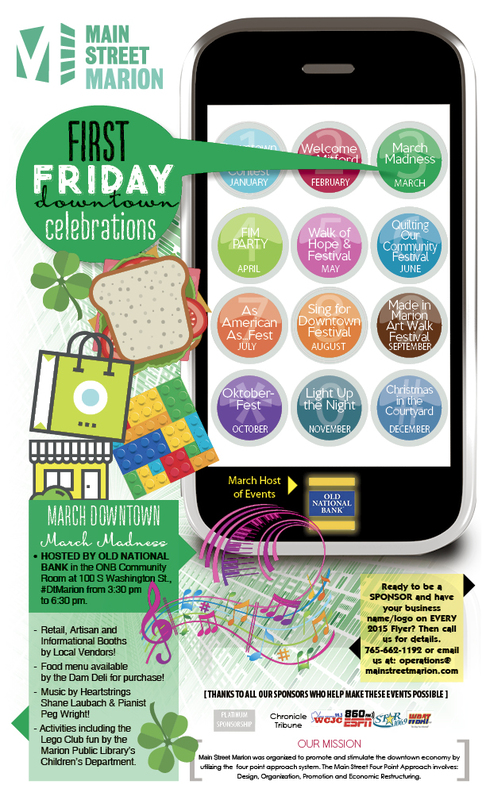 First Friday is a monthly downtown celebration that encourages collaboration between non-profit, university, and commercial venues in Marion, IN. This initiative showcases downtown venues by promoting the First Friday evening of each month as a community night for experiencing what our downtown district has to offer. First Friday ensures a healthy city through regular exchange and discussion between venues, artists and patrons. Expect the unexpected and come play with us! We look forward to seeing you on the first Friday of every month downtown. On behalf of Main Street Marion, we thank you for helping us make a positive difference in our community! Share our event flyer with your friends! Next Welcome To Main Street Marion’s Open House!